Is there a #1 American comedian? 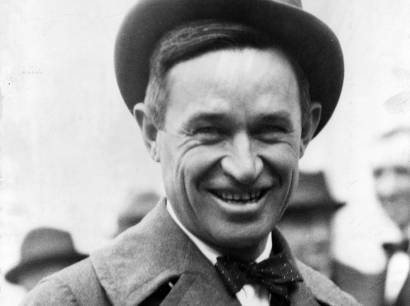 For years Americans said, "It's Will Rogers!" Take your pick. There’s plenty out there—American comedians. Dead or alive, nice or mean, clean or dirty, hot-air balloon poppers, and truth sayers! There’s no number one. Americans laugh! Dr. J.C. Gregory claimed, “The way [people] laugh and the things they laugh at reflect their tastes, thoughts, and sympathies….” Hmmm. Will Rogers’ first reason was simpler. He could not resist being a comedian. As a kid, it often meant getting into trouble with his dad; later it led him to becoming the most famous comedian in the United States in the 1920’s and 1930’s. His mother wanted him to become a Christian minister. When he ran away from home, a relative said that his destiny was to be hung as a horse thief. Neither happened. By age five Will could ride a horse. He often said, “I was born bowlegged so I could set on a horse.” When he was fourteen, he competed in a rodeo against older cowboys and won in riding and roping contests. He loved the life of the open range in the old Indian Territory, now called Oklahoma State. His parents were Cherokee Indian, Irish, and Scotch. His father was a cattle man, and a Cherokee judge and senator. Since his parents wanted him to get a better education than was available in the Territory, they sent him away to school. He was an avid reader, but he sure did not like the strict rules of school and dropped out after tenth grade. Will worked his way around the world. In Argentina, South America it was ranch work working with gauchos. In South Africa, it was breaking horses. There he made the break into show business as a cowboy doing rope tricks. He was billed as The Cherokee Kid and from the beginning was the star attraction. He worked his way to Japan, China, and back home, where he met the new girl in town. She became his sweetheart, wife, and manager. Before their marriage, Will returned to Wild West shows. He was fascinated with the theater and studied other performers. Though shy about talking on stage, he began talking more. In 1912, his talking tidbits became monologs with audiences roaring with laughter at his relaxed smart cowboy humor. This is Barbara Steiner waiting to hear more about Will.